Let's talk water bottles. Why? Because if you like to make sure your kiddos are hydrated on the go, not all water bottles are created equal. Both my youngest son and my granddaughter carry water quite a bit, and they like to have them in their own bottles. Zak makes a great selection of them, as well as many other items (for kids and adults). 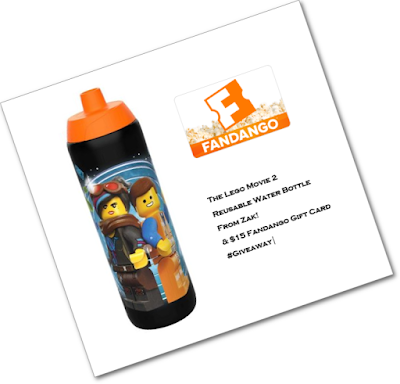 Right now we're loving their new reusable water bottles from The Lego Movie 2 collection. When you're choosing a water bottle, you want a spout that makes it easy to drink, but also one that shuts so you don't have spills. As the parent, I also want one that is easy to wash. These two Lego Movie water bottles have different types of spouts, but both are easy for children to use, and for me to make sure stay clean. They also both seal, and are made responsibly with materials that are not bad for my children, so every element I look for in a water bottle is present. Literally, we take our water with us everywhere we go. In this picture you can see it's raining outside. We forgot our umbrellas, but we didn't forget our water bottles! We went to the movies this weekend, and enjoyed the show we saw, but it's Friday, February 8th that we're excited for because that's when the new Lego Movie 2 will be playing. Until then though, we'll be enjoying our drinks in our Zak Lego Movie 2 resusable water bottles. 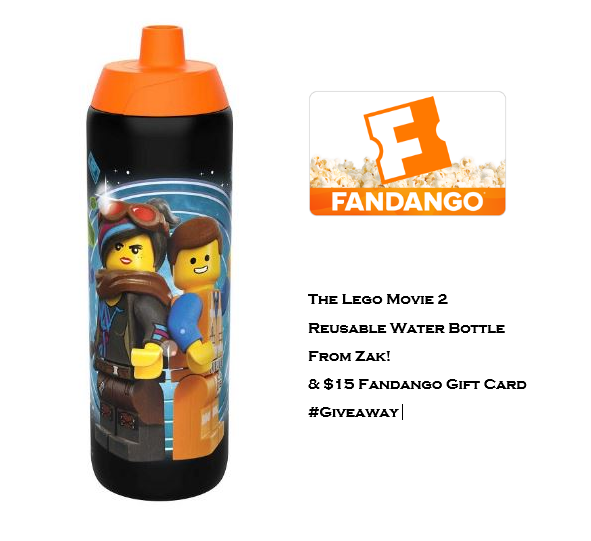 The red version of The Lego Movie 2 reusable water bottle holds a generous 25 oz., which is the size my son prefers when he is on the court. He plays hard, and needs to hydrate regularly throughout his practices and games. He likes this one too, because the drinking spout has a wide mouth so he can put crushed ice or smaller ice cubes in there, which means it will be ice cold when he gets around to drinking it. It is BPA-free and top-rack dishwasher safe. He also likes that you can see how much water is left in this bottle, so he knows when it's time to refill it. I like that the cover snaps in place, so his spout is protected from other players' germs, especially this time of year when the littles are getting sick left and right. This 24 oz. resusable water bottle from the Zak character collection is also BPA-free, dishwasher safe, and has a one-way valve and silicone gasket on the spout to prevent leaks. It also sports a design all the way around it, including this cute duo (Wildstyle and Emmet) from the movie and Lego Batman and Robot on the back. It's a plastic bottle, which is great for the kids because it's more durable for them than glass. If your children are taking their water with them everywhere they go, this is sure a fun way to do it. One lucky winner gets the Lego Movie 2 Wyldstyle/Emmet resusable water bottle from Zak! and a $15 Fandango gift card to go see the movie themselves. US entrants only. I like the Disney Frozen Anna and Elsa 8-inch plastic plate for kids. Now that's a good giveaway! I like the Wonder Woman items. I learned that they have the cutest Mickey and Minnie Mouse drinkware and dinner wear. My daughters would love this. I like the DC Comic Character Mugs especially the Joker! I like all the Hello Kitty products especially the 4 compartment lunch container. Andrew.gordonpe@gmail.comI like the spider gwen coffee mug. I learned they have everything from these to tablewear. I also learned they have characters right down to Christmas movie characters. I love the BB8 mugs! I like the frosty the snowman collection. I love that they have so many different designs and characters that my kids love. My grandson would love the Star Wars Solo collection. My son would like the Star Wars collection. I like the Disney Frozen Collection. I would get that for my daughter. I love the Disney and Marvel stuff. I like Marvel Salt and Pepper shakers. I really like the Harley Quinn 10 oz. ceramic coffee cup!! Way more fun than my bland water bottles, but they do the trick. I like the finding dory bottle! I love all the Mickey Mouse stuff! I like the stainless steel Wonder Woman bottle. I like the Elf Christmas Glass Tumblers. I like the Trolls collection! I like DC Comics 2 oz. Glasses. They look fun! We're always in need of glasses. I tend to have the dropsies at times. I really like their collection of Disney dinnerware and mugs. My granddaughter would love the Paw Patrol water bottle. I like the video game character products. Those bottles are super cute! I have a nephew who loves him some Lego Movie. I bet he'd like to get these in his Easter basket this year. I learned that there is a variety of Minnie and Mickey Mouse items as well - so all of our 6 grandkids will be HAPPY. I want the LEGO water bottle! I love the marvel character collection. my son would like that too. I went to the site and I love the Wonder Woman items. I love all the branded kitchen ware. I have a yoda coffee mug from them. My niece would love one of the finding dory glasses. I like that there is such a great selection. Something for everyone! Whether you are a Disney fan, Nightmare Before Christmas, Marvel or others, Zak has something you will love! I like the Minnie and Mickey water bottle. I learned how to make cold brewed coffee at home. Like the ceramic coffee cup. I like the mickey & minnie mouse 3-section kids plate. I learned that Zak has all kinds of different Disney and other character designs that you can get on water bottles! I will totally go to them if I ever need a present for a kid who likes a certain character! I love the adorable Pokemon dinner plates. The whole Pokemon collection is cuuuute! They also have Pokemon and Minecraft plates. My son would love minecraft. Didn't know they made silverware. Even fan-favorite villains like Joker and Harley Quinn get a chance to join the fun, with coffee mugs and glassware that will make your drinks pop. With fun retro comic art and exciting graphics from the new movies, justice will always be served at your table. I like the Mickey and Minnie items! I really like the Zak collectibles. I like that Zak has a variety of characters including Disney, Marvel, Star Wars, and animated series. I think my nephew would love the Teenage Mutant Ninja Turtle set. I love the DC Comics items! I like the Black Panther ceramic coffee cup. I learned that they have logos and characters from a very large group of fantasy, storybook and superhero stories. I love the variety of Hello Kitty items! Some really cool stuff! I really like the Black Panther Coffee Mug! My daughter would love to have any of the Hello Kitty items too! My husband is way into the DC Comic stuff, so he'd love some things on here. I like the black panther mug. I like all the Wonder Woman merchandise! I learned they have something for everyone. I love the Star Wars products. I liked the DC comics 4-piece set of 2 oz. mini glasses.